Pritzker Winner Designs to Serve the Public Richard Rogers, who has won architecture's top prize, designs buildings that flaunt their infrastructure — like Centre Pompidou in Paris. But he also has an interest in city planning, and pushes for walkable, welcoming cities. One of his new buildings is part of the World Trade Center site. 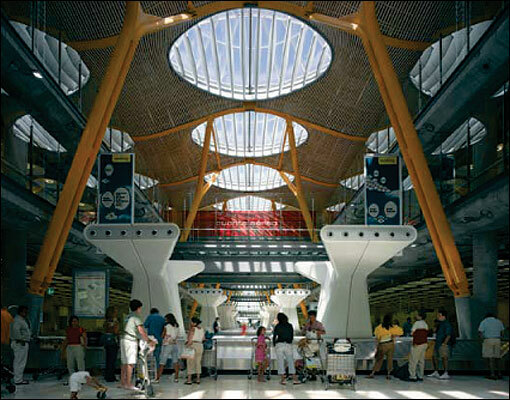 The baggage collection area at the Madrid Airport has a bamboo-lined ceiling and natural light. 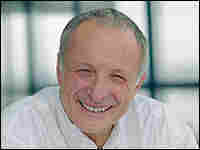 The Pritzker Prize, the world's most prestigious prize in architecture, goes to Richard Rogers. Rogers' most famous buildings are much like the transparent models of the human body that display the arteries, nerves and "plumbing." In bright colors, Rogers' buildings show the tubes that carry heating, cooling, plumbing and electrical lines, as well as the elevators going up and down. 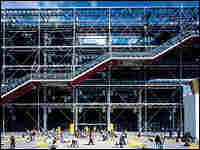 He did that in the 1970s with Renzo Piano at Paris' Pompidou Center. He then designed an inside-out Lloyd's of London, in that city's normally staid financial district. Having drawn more than his share of controversy, Rogers, who works in London, is pleased with the recognition. "It's a happy moment, and one hopes it's good for architecture, and certainly for all the wonderful people I work with," Rogers says. "It's terrific." Just a few years ago, his career took a hit when the huge Millennium Dome he designed for London failed to attract as many visitors as hoped. Last year, his terminal at Madrid's airport was better received. 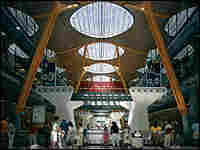 The terminal roofs undulate, held up by angled columns in his trademark canary yellow and other bright colors. The ceiling is lined with bamboo. And as in many of his other projects, the sun shines in through modern energy-efficient glass. "Our buildings tend to be full of light," Rogers says. "Another important part is the feeling of place, and climate change and how we can create buildings which use the minimum of energy and as clean as possible energy." Rogers, 73, often bicycles to his studio. He advocates high-density, user-friendly cities, saying they're more exciting and more environmentally responsible. He asks city planners around the world to push for better public transportation and places to walk and meet. "Richard Rogers has gotten quite involved in shaping policy, and I think that is an appropriate role for an architect, especially today," says Karen Stein, the editorial director of Phaidon Press, and a member of the Pritzker jury. "He really sees that an architect can be a concerned citizen in the world, and I think that's significant as well." "Giving the Pritzker to Rogers is giving it to someone who still has a commitment to architecture that may go against the grain a little bit," says Michael Hays, who teaches architectural theory at the Graduate School of Design at Harvard. "Architects and clients often find it much easier to seal off commercial spaces, to seal off private spaces, from the street, from the city, because there's more control," Hays says. "...Rogers is someone who has insisted in all of his projects on this public dimension." And there's a simple explanation for that, Rogers says. "Cities have one reason, and that reason is for the meeting of people. And then you need beautiful places." One of Rogers' current projects is at the site of the World Trade Center. While the other towers there will have smooth facades of taut glass, his creates urban drama by strutting its diagonal bracing all the way up the sides. At the base, he's designing pedestrian areas and benches, with expansive views of the memorial. He believes a good building must serve its client and the people passing by.